Bosnians demonstrate in front of the parliament building in Sarajevo. Demotix/Sulejman Omerbasic. All rights reserved. On a typically warm night in Sarajevo a crowd gathered in front of the parliament for a candlelight vigil for three month old Berina Hamidovic. From Tuzla to Mostar, Bosnians across all ethnicities joined fellow protesters in Sarajevo as a show of respect for the Hamidovic family before they are forced to bury their child on 17th June, exactly three months after her birth. 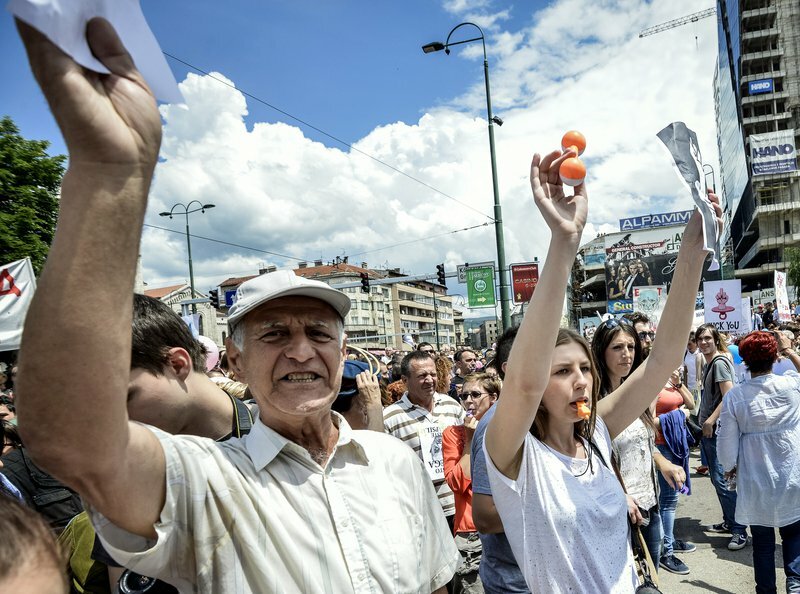 When news of Berina’s death was announced on June 16, over a thousand people gathered in front of the Bosnian Parliament not just to show support for the bereaved family but to peacefully protest the role politics played in the tragedy. This was an uncharacteristic show of unity within the country among ethnic Bosniaks, Serbs, and Croats. Berina's case has become symbolic of the deep problems in Bosnian politics. Why is Berina dead? Upon birth, she was diagnosed with a tracheoesophageal fistula, a treatable genetic anomaly preventing her from consuming food. Unfortunately, the medical facilities in Bosnia are not capable of addressing such problems, meaning the only other option for the Hamidovic family was to make the five hour journey into Serbiaby car . However, due to political bickering along ethnic lines that has plagued Bosnian politics since the break-up of Yugoslavia, assignment of Unique Master Citizen Numbers (JMBG) was allowed to expire in February over a dispute on canton borders among the politicians representing the ethnic groups that constitute Bosnia. As a result, children born after February were not assigned a JMBG number and, therefore, could not obtain medical cards or passports, both vital documents in being allowed to cross the border. Without either of these, three-month old Berina could not legally make the trip for her medical treatment. Berina’s death comes after a landmark period in terms of the development of Bosnian civil society. While media coverage across the world has focused on Taksim square and developments in Turkey, 1,000 km away mothers with their pushchairs are joined by students, taxi drivers, the elderly - be they Bosniak, Croat or Serb - to finally speak up against what seemed to be the blatant indifference of politicians to the wellbeing of the most vulnerable in society. These were sparked by yet another case when the mother of another 3 month old girl, Belmina Ibrisevic, in a desperate bid to obtain authorisation for her daughter to travel to Germany for a stem cell transplant, blocked the exits from the House of Peoples in Sarajevo. As a show of support, on June 6, 3,000 people joined together to prohibit the exit of any politician in the parliament until an agreement was reached, effectively trapping 1,500 lawmakers inside the building. While a temporary solution was achieved for Belmina, the wheels were already in motion, with the protesters refusing to merely accept short term solutions on a case by case basis. These numbers would inflate vastly to an unprecedented 10,000 as the week progressed, with people flocking to Sarajevo as a show of support. The categorisation and segregation of ethnic groups was, for the time being, overcome as the primary concern now became one for those who are too young to form any conception of national identity. The lack of urgency in resolving the JMBG issue was not the most catastrophic of decisions taken by politicians in Bosnia, but it was the straw that broke the camel’s back. On its own, one cannot expect the expiration of JMBG to have pulled in such a large crowd, and, given the lack of progress that had been made on the issue by political figures, it is clear that they shared the same thoughts. The fact is that Bosnia is currently struggling on all fronts. Unemployment has steadily increased to approximately 40% in 2012 while food prices continue to rise. The population continues to remain disillusioned with the political process and its ability to provide employment and an improvement in living standards. Even in the predominantly ethnically Serb Republika Srpska, students began protesting in Banja Luka due the lack of improvements in living standards in what is seen as the ‘better off’ entity in the country. The situation may be set to worsen as the country’s largest trading partner outside of the EU, Croatia, joins the European Union on July 1, thus demanding a higher standard of quality control for imports than what the current agricultural infrastructure is able to provide. Gone are the days where Bosnia was on the front pages of the European agenda. The EU has begun to look inward amidst its own internal problems; other states in the Western Balkans have overtaken Bosnia on their path to EU membership. The only current glimmer of hope for the country is the excellent progress of the national football team in their World Cup qualifying campaign. All of these factors created the perfect conditions for the development of mass protests. All that was missing was a spark to set the dry kindling aflame. The main question now is what follows these protests. Bosnians and Herzegovinians across all ethnic lines have found their political voice on an issue that transcends ethnic politics. The sentiment and feeling behind these protests therefore cannot be allowed to fizzle away. Politics in Bosnia has for too long been defined by its institutionalisation of ethnic division and the only way progress can be achieved is through the combination of assistance and encouragement from the EU and the population holding their representatives responsible for their actions through the exercise of their right to protest. On the path towards European integration, the EU has been pushing Bosnia to make the necessary reforms by calling for a change in the constitution to allow minority representation in the political process as a condition for membership. However there needs to be a greater use of soft power to ensure that the EU remains an attractive option for the population. Bosnia and Herzegovina remains Europe’s unfinished project 18 years after the signing of the Dayton peace agreement. The assumption that the status quo can persist for the time being as long as the sides don’t revert to civil war is not a sustainable solution in the long run, and support for such political movements needs to be ever present to serve as a reminder that the aims for the EU and Bosnian citizens are synonymous. What has been lacking up until now, however, is a bottom-up approach to provide the necessary impetus for domestic political reform, an approach that is now embodied in the JMBG protests. In Bosnia and Herzegovina, regardless of the success of these protests, barriers to real political change will continue to exist. These protests will not magically solve the country’s problems and end the endemic corruption of political figures. Any path Bosnia takes towards EU membership will remain long and arduous. Real political change will not occur overnight, and, given the refusal of the protestors to accept any short term solutions to the JMBG problem, real political change is what is now expected. The importance of the protests, however, cannot be understated, not for what they achieved (nothing as of yet) but what they signified. In a country where political participation rarely goes beyond voting in elections, the protests on June 6th signify what are hopefully the first steps towards a stronger civil society. Whether this is built upon in the coming weeks remains to be seen.